If you’re anything like me, those five words are the worst words you could possibly hear. It’s that time of the year, folks: the time for the dreaded holiday potluck. You know the drill. You’re invited over to your best friend’s house, or maybe it’s your crazy aunt’s family get-together that she insists on hosting every holiday season. Either way, you’re forced to cook. You’re panicking because the pressure’s on. You want to wow everyone with your fabulous dish, but the last time you tried to make cookies you set the fire alarm off. Well, panic no more, because I have a list of 5 easy dishes that require little to no effort to make. I guarantee that if you bring any of these dishes to your potluck, even if it’s your weird neighbor’s Christmas party, it’s sure to be a huge hit. People may even suggest that you star in the next season of Bravo’s Top Chef. Maybe. Because who doesn’t love cheese? In a small skillet, pour the balsamic vinegar and cook over medium heat to reduce the vinegar. This should only take 5-10 minutes, make sure that you stir occasionally. Take a toothpick and stick one cherry tomato, a basil leaf, and one mozzarella ball. Season with salt and pepper, and then use a teaspoon to drizzle some of the balsamic reduction onto each appetizer. Sprinkle with salt and/or pepper. These are the star of the show every time. First, heat the oven to 400 degrees. Slice brussels sprouts in half. Heat the extra virgin olive oil in a pan over medium heat until it begins to simmer. Put the sprouts in the pan cut side down, add in the garlic, and sprinkle with salt, pepper, and parmesan cheese. Cook the brussels sprouts over the medium heat until they begin to brown on the bottom. Then, transfer them to the oven. Roast them for about 10-20 minutes, until they’re very brown. Stir in balsamic vinegar, sprinkle with more salt, pepper, and parmesan. You can serve this hot or warm. Cook the macaroni using the directions from the box and set aside. In a medium saucepan, melt the butter over low heat and then add the flour. Stir until smooth. Turn it up to medium heat and add milk until the mixture is thick. This will take approximately 10 minutes. Add the hot sauce, cheese, and bacon. Pour the mixture over the pasta and stir together. 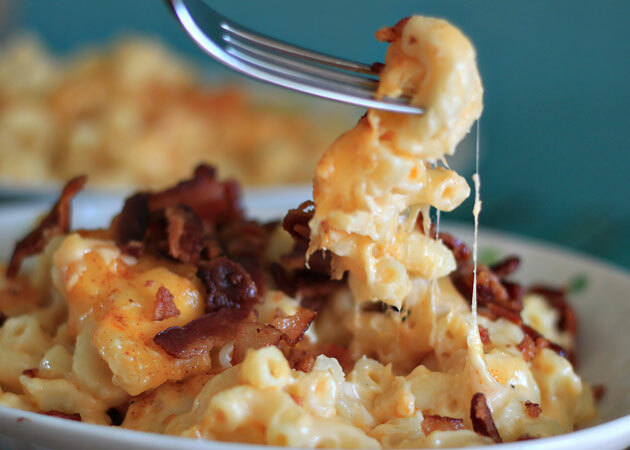 Pour the macaroni and cheese into a 9x13in baking dish and top with any extra cheese or bacon bits you have left over. Bake in a preheated oven at 350 degrees for 25-30 minutes, or until the top is golden brown. You don’t even need an oven to make this one! Line an 8-by-8 inch square baking pan with aluminum foil, and then spray with cooking spray. In a medium saucepan over low heat, combine the chocolate chips and the condensed milk and stir together until melted. Pour the mixture into the baking pan, making sure to spread it evenly. Sprinkle on the crushed candy canes, and refrigerate for 2 hours. When ready to serve, cut into small squares. These cookies are HUGE and are sure to leave people full for hours. Preheat your oven to 350 degrees and spray cookie sheets with cooking spray. In a large bowl, combine the peanut butter with the sugars and the stick of butter. Mix well, and then put in the eggs and the vanilla. Put in the oats and the baking soda. Then, stir in the chocolate chips and M&Ms. Put large spoonfuls onto the cookie sheets. Bake for 10-12 minutes, and then let cool for 5 minutes. And there you have it! Five foolproof holiday potluck recipes that are sure to impress anyone and everyone. Good luck surviving the actual potlucks, though.